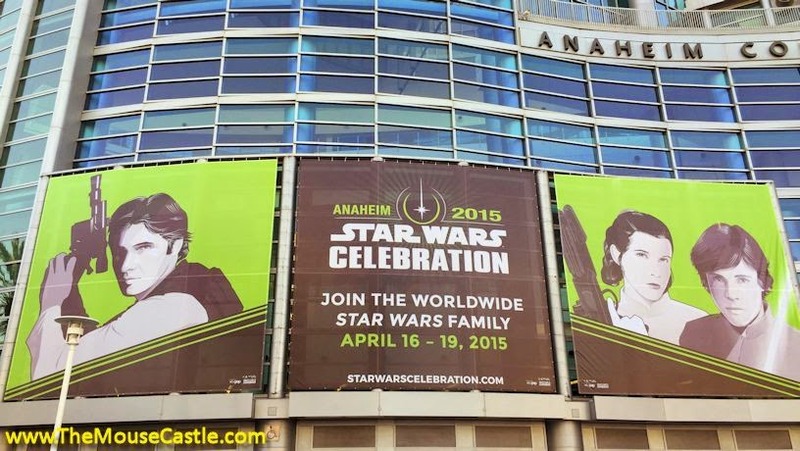 Star Wars fans from around the world are at the Anaheim Convention Center for Star Wars Celebration, a 4-day extravaganza of presentations, exhibits, costumes and celebrity guests that are all about that time long ago in a galaxy far, far away. Team Mouse Castle is here all weekend, checking out as much as we can, talking to fans, attending presentations, totally getting our geek on. And in a year that will see the release of Star Wars: The Force Awakens in December, all I can say is you can feel an awful lot of excitement among the tens of thousands of fans here at Star Wars Celebration. Thursday, day one, was a huge day at Star Wars Celebration. The event kicked off with the highly anticipated appearance of Star Wars: The Force Awakens director J.J. Abrams and producer Kathleen Kennedy. And they did not disappoint. You might have heard something about it. There was this--I don't know--movie trailer, I guess, that premiered. That was the biggest highlight of the day in a day full of highlights. There were a lot of fans and a lot of fun. Thursday night, my buddy Scott Linder and I got together over a few cocktails at the Anabella Hotel to recap day one and to look ahead to what else is in store this weekend. It's not a trap. It's Star Wars Celebration in The Mouse Castle Lounge.